Welcome to NIJA and TELDE. NIJA BOXERS are located outside the city limits in the suburbs of Sydney - a short drive from DogsNSW Canine Complex. We have been established for over 35 years and breed occassionally; mainly when we are looking to exhibit with a new puppy. We pride ourselves on breeding quality puppies / adults for the family enviroment, exhibition and obedience rings. But what gives us the most joy is seeing our puppies in a loving family home. Here Nija Boxers are at home with young daughter & a teenage boy; the children see the girls as their best friends before they are show dogs, but they do love it when they win a ribbon or a prize for them. As the law in Australia states that we can no longer have docked tails and as we feel that a natural long tail was not for us we came to the conclusion we would no longer be breeding Boxers. Then we had heard and read about Dr Bruce Cattanach's work / research and breeding into / for the Natural Bobtail / Natural Short Tail Gene and after a lot of discussions, research and more discussions we decided to bite the bullet and incorporate the Natural Short Tail / Natural Bobtail into some of our breeding. 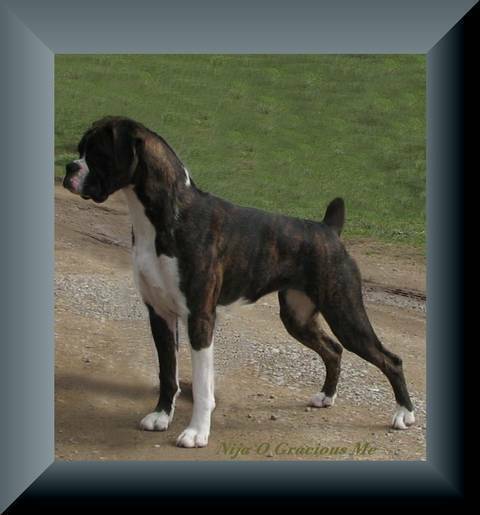 Having bred Natural Short Tails / Natural Bobtails for numerous years now we have found that the Natural Short Tailed / Natural Bobtailed Boxer are no different in type, temperament, health etc. to our previous breedings. We have managed to maintain our heads, movement, construction and most importantly temperament that all Boxers should have. TELDE DALMATIANS and BOXERS are located in the Hills District, a lovely leafy semi rural suburb in northern Sydney. Here they have large paddocks to play in by day and a stream to wade in, which they seem to do in all kinds of weather. They love it when my grandchildren of all ages - young to teens come to visit, which they do often, especially when there are puppies here. "If you don't have a dog - at least one - there is not necessarily anything wrong with you, but there may be something wrong with your life"
If you would like more information on a BOXER or DALMATIAN puppy, or to enquire about the availablity of a puppy please contact us through the Contact Information page. NIJA BOXERS & TELDE DALMATIANS & BOXERS place great emphasis on breeding Boxers and Dalmatians that are healthy, sound in temperament and structure that are ideal for the family enviroment. We will continue to health test all of our dogs prior to breeding and our puppies prior to leaving with their new families.